JERUSALEM - A second consecutive day of violence at Jerusalem's most sensitive holy site prompted a rare warning Monday from the king of Jordan, the custodian of the ancient sites, while an Israeli man died and several people were injured after attacks by rock-throwing Palestinians. The holy site is a frequent flashpoint and its fate is a core issue at the heart of the Israeli-Palestinian conflict. Jordan, which has a peace treaty with Israel, administers Muslim religious affairs at the site, sacred to both Jews and Muslims. The compound is known to Jews as the Temple Mount, site of the two biblical Jewish temples. Muslims revere it as the Noble Sanctuary, where they believe the Prophet Muhammad ascended to heaven. Earlier Monday, Israeli police and Palestinian stone-throwers clashed for the second day at the site. Police spokeswoman Luba Samri said protesters threw rocks at officers who entered the area to ensure security. She said several masked Palestinians suspected of stone throwing were arrested. Police also arrested protesters who attacked a Jewish man, she said. The director of Al-Aqsa Mosque, Omar Kiswani, said dozens of people had stayed at the mosque overnight. He said police "stormed" the area on Monday morning, firing tear gas and stun grenades and making several arrests. The 64-year-old Israeli, Alexander Levlovitz, died and two passengers were hurt after attackers pelted their car with rocks in Jerusalem. Samri said the man was injured as he was driving home from a meal marking the Jewish new year and later died of his injuries. She said the identity of the attackers was unknown but that they were likely from a nearby Arab neighborhood. A young Israeli woman, Bosmat Haberfeld, said she was driving along the same route when her car was attacked. "They tried to throw rocks in our direction but missed and hit the driver behind us who lost control of the vehicle and was killed," she told Channel 10 TV. "We stopped a few meters away on the side to call the police. My mother saw a masked man run toward the car with a slingshot, she screamed at me to duck. I ducked down and I heard the glass shatter and my mother and I were covered in broken glass." She said a resident from a nearby Arab neighborhood, driving a motorcycle, later stopped, checked to see if she and her mother were aright and gave them water. Later Monday, another Israeli was injured by Palestinian rock throwers on the outskirts of the Old City in Jerusalem, police said. There has been a spike in Palestinian violence against Israeli civilians and soldiers over the past year, which has included fatalities and casualties. In Jordan, King Abdullah II warned Israel, saying the kingdom was "very concerned and angered with the recent escalation's in Jerusalem, specifically in Al Aqsa Mosque" in Jerusalem. He issued a statement ahead of a meeting with visiting British Prime Minister David Cameron. "We have gotten reassurances from the Israelis government that this would not happen. Unfortunately, these are reassurances we have heard in the past," the king said. "Any more provocations in Jerusalem, will affect the relationship between Jordan and Israel; and Jordan will have no choice, but to take action, unfortunately." On Sunday, police clashed with Palestinians who barricaded themselves inside the Al-Aqsa Mosque in Jerusalem's Old City and threw rocks and firecrackers. Since Israel captured east Jerusalem from Jordan in 1967, Jewish worshippers have been allowed to visit - but not pray - at the compound. 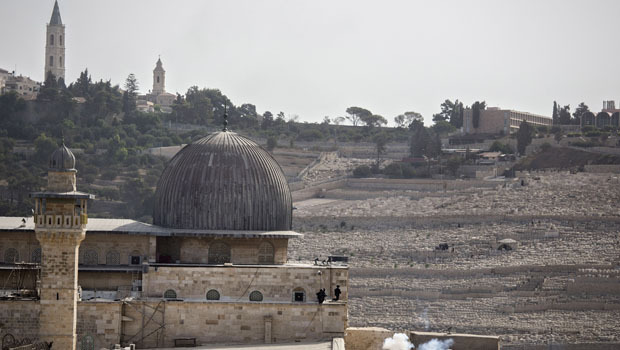 Muslim authorities view the presence of Jewish worshippers and Israeli police as a provocation and accuse Jewish extremists of plotting to take over the site. Israel has promised to ensure the status quo at the site. Israeli Prime Minister Benjamin Netanyahu will convene an emergency meeting over the recent Palestinian attacks on Tuesday night, after the Jewish new year holiday of Rosh Hashanah ends, an official at the premier's office said hours after Levlovitz died in the attack on his car. "The prime minister views with great severity the throwing of rocks and fire bombs against Israeli citizens and intends to fight the phenomena by all means, including increasing punishment and enforcement," the official said, speaking on condition of anonymity according to regulations. U.N. Secretary-General Ban Ki-moon said the latest escalation at holy sites in Jerusalem and other violence, including the stone-throwing incident that led to the death of an Israeli man, "once again underscored the importance of reaching a final status agreement through negotiations on all issues, including arrangements for the holy sites that are acceptable to all." Palestinians have also been assaulted - in the deadliest such incident, a Palestinian toddler was killed in an arson attack on a home in the West Bank in July. His parents later died of their wounds suffered in that attack. That attack was widely condemned across Israel's political spectrum and the government vowed to crackdown on Israeli extremists. In Washington, State Department spokesman John Kirby said the U.S. is "deeply concerned by the recent violence and escalating tensions" surrounding the Jerusalem holy site and called on all sides to "exercise restraint, refrain from provocative actions and rhetoric and preserve unchanged historic status quo" at the site.